Wednesday night, the Sabres and Leafs squared off for the first time this season and the "QEW battle" lived up to the hype to say the least. The best players showed up on the scoresheet for both teams in the back-and-forth affair including Jack Eichel scoring twice for Buffalo when they needed it most. Both of Eichel's goals came in the third period and his second goal of the game gave the Sabres a 3-2 lead. They couldn't hold on to the lead, but the go-ahead goal energized the bench and the Sabres' staff, who struggled attempting to celebrate the goal. 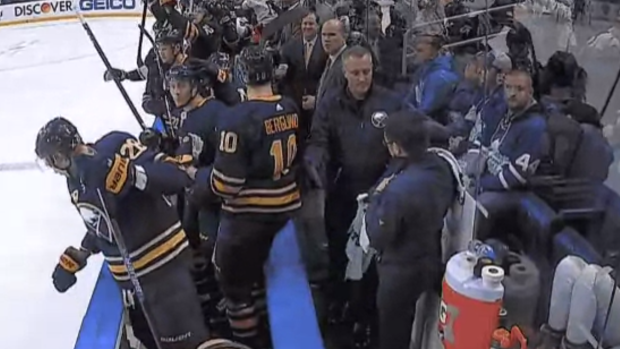 Handshakes don't get more awkward than that and unfortunately for those two members of the Sabres' staff, they'll have to wait until next game to correct things as Buffalo didn't score again and lost 4-3 in overtime to the Leafs.